If it isn't entirely obvious I keep a (now 7 year) blog/diary about me training my dogs and all the unlikely places it's taken me, but this is more about me than them so it seems more appropriate to put it here. Dog agility is a love of mine. I really like the problem solving aspect of it and it's something I can do well. One of my dogs I got with agility in mind, the other I got to manage the first dog and to maybe do agility. Well that was the plan. Turns out that agility is not Dog #1's (whose name is Yoshi) passion at all and all the dogs crowding around kinda drive him a bit nuts. The reason? He's an order obsessed herding dog. Unauthorized motion drives him crazy and an agility trial is full of such commotion. All he wants to do is tell other animals what to do to the point of clamping on to them which is rather frowned upon by all of us. He is very physically talented, and could have gone to any high powered agility school he wanted and done well (in fact for a while he was at one). It took me months to figure out that all he really wanted to be was a Ranch Hand. Yes, my son the Ranch Hand who is pictured here. I'm realizing that there's a lesson in there somewhere. You have a plan for a child or a pet of yours and it turns out that's not what is going to happen. I'm used to the idea that children have to make their own choices, but I sort of thought that I'd have some power to dictate what my dog did and I do, but it's hard to see your dog stressed out and being a freaky boy about OMG there's a dog/cat/squirrel/etc moving, so I gave in and we both started to learn herding. 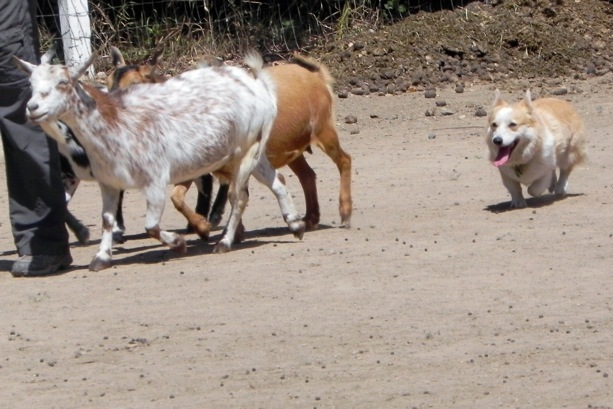 Herding is a very difficult thing for a dog to learn as the dog has to respect what the handler says, in particular, STOP moving when asked. What this means is that we argue a lot which I first thought was not a good thing for our relationship, but then I started to notice how happy he was. He's still a head case as he worries about not being able to control the stock and starts whizzing around in manic circles which doesn't make anyone happy (especially the sheep, though the goats aren't thrilled about it either), but we're learning and I find myself in a pasture stomping around in herbivore poop wondering how I got there. I used to be a horse person so pastures are at least familiar, but this is still not where I was aspiring to. I was more thinking the Agility National Championships. This certainly isn't it, but I look at the photo and realize that he's right were he wants to be. For me, Facebook is an excellent source of levity and reality check. For World Peace I said that I thought I should instead work on World Power and Dominion, but dictators aren't doing so well these days. I could go back to the idea that I wanted to start my own religion, but you have to have a certain delusional intensity and maintain it. I guess that's true for dictators too. In July I finally climbed all the way up Mt. Whitney after figuring out how to overcome a lot of altitude issues and learning to feel comfortable around snow and rock. It's been an accidental 10 year journey, one that I gave up on a few times, but couldn't let it go and would go back every couple of years or more often (once even twice in a year). - snow skills like "self arrest" which is stopping your slide down a mountain with an ice axe. - route finding with a map and gps/compass, and how to travel cross country. And I learned the reality of "climb high, sleep low" as it's the one thing that kept me healthy, as I know that my body doesn't do that great with altitude, even if I can climb in it. So I'm left with Now What? I've fallen in love with Mt Shasta and am getting to know Yosemite, and working on them further seems like a natural, but I hesitate to take on another inadvertent long term project. Shasta is a tough enough mountain that it's possible despite if I keep trying that I might never summit it and I'm not sure I want to deal with that kind of "I'm a failure" disappointment. I think I'm more interested in attainable goals, which is wussing out in a way, but honestly I'm tired of failing, and I want to work on something I at least have a chance at succeeding at. Mountains offer easily recognizable goals. Get to the top, being the most obvious version among many. And I love climbing even if I struggle physically. But my first love besides horses and dogs is cycling, and I'm thinking i want to do more of that especially mountain biking. And, of course, there's the dog sports obsession. Accidentally, I have three dog sports. Agility is my first love, but one of my dogs really likes Herding (something I never thought I'd do) and the other is partial to Obedience and Rally. But it's fun to do other things besides dog sports, even though it makes me chronically short on time, so I want to focus on something else but don't know what. One thing I've noticed is that I really like climbing up something and then being able to safely go down much faster. I'm not that patient with hiking in that respect. Once I've climbed something, I'm ready to go down ... fast. Hence my love of cycling, skiing and glissading on snow (way cool). Mt Diablo has a lot of fireroads that are actually too steep for me to bike much of, but I'm happy to push the bike up just so i can go down (weeee.) River kayaking (as opposed to Sea kayaking) has going down rapids but it's a logistical hassle (two cars to shuttle things around), and there is that drowning potential that is a little bothersome, though that should get better with more experience. So I dither and just have short local adventures. The most recent being crashing down Shell Ridge in Walnut Creek. Ah well, the flesh wounds are healing.